Adults can focus on broadening connections with multiple local networks. When working with youth, the best results can sometimes come from working in partnerships. For example, in an SBHC setting, partnering with school counselors and/or the disciplinary offices can allow the SBHC to reach youth that could benefit from youth-led initiatives. This is also true in community health settings; collaborating with local schools or fellow community centers that work with youth can foster a bridge of support. Conduct a community assessment and generate a list of potential supporters. Identify community members with specific child and adolescent health content expertise who can train youth. Consider engaging people in influential roles like school board members, heads of neighborhood associations, faith leaders, and business leaders who can be supportive allies. Develop a strategy for engaging community members. Establish clear communication between the community and health center. Host community events to highlight great youth engagement work. Create a calendar of events to distribute to community members to keep them abreast of upcoming activities. ACT for Youth. What is Youth Engagement, Really? Available at: http://www.actforyouth.net/youth_development/engagement/. Accessed July 2015. ACT for Youth. Community Collaboration. Available at: http://www.actforyouth.net/youth_development/communities/collaboration.cfm. Accessed July 2015. 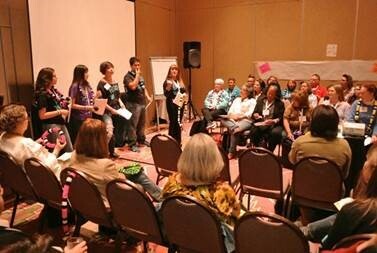 4-H. Youth-Adult Partnerships in Community Decision Making. Available at: http://4h.ucanr.edu/files/2427.pdf. Accessed July 2015.